1. Join Mandurah Cruises for a 1 Hour Dolphin & Canal Cruise and spot our playful local dolphins. Special Summer Offer: Kids Cruise FREE* – Valid for travel until 3rd February 2019 (inclusive) – Promo code: ‘SUMMERKIDS’. *1 Child Cruises FREE per fully paying adult. 2. Watch one of the new release movies at Reading Cinemas Mandurah– The Grinch, Spider-Man, Ralph Breaks the Internet, Mary Poppins Returns – or get the best of both worlds with our Cruise and Movie events. 3. Have gravity-defying fun at the NEW Flip Out Mandurah. The kids (and kids at heart) will be bouncing, back flipping, cannon-balling into foam pits and more. As well as their main trampoline arena, they have a massive parkour arena, ninja warrior course and battle beam zone. 4. Explore Mandurah on Mandurah Dolphin Tours NEW Dolphin Shuttle – Hop on and off all day at Stop 1 – Mandurah Foreshore, Stop 2 – Mandjar Bay and Stop 3 – Dolphin Quay. Only $10 adult and $5 child for an all-day pass. Now that’s value for money! 5. Splash, jump and slide into Just 4 Fun Aqua Park! Located on the Eastern Foreshore, this inflatable floating water park is fun for the whole family. At only $15 per person for 45 minutes it’s one of the best value summer activities in Mandurah! 6. Experience the magic of Christmas on a 1 Hour Christmas Lights Cruise with Mandurrah Cruises. Departing every night from 1st December to 6th January. This spectacular family event is not to be missed! 7. Let the kids climb the walls at Mandurah Indoor Rock Climbing. It’s suitable for all ages with no experience necessary and is a great challenge and confidence builder. They also offer trapeze and ninja classes! 9. Enjoy a game of Disc Golf at Hall Park on the Western Foreshore. It’s a FREE nine basket course and a fun game for the whole family. 10. There’s some great indoor playgrounds in Mandurah! Bounce on into Inflatable World Mandurah – one of the biggest Indoor Inflatable Playgrounds in Australia! And let the kids stay and play all day at Chipmunks indoor playground Mandurah which is suitable for kids aged 0 – 11 years and features a café for parents to supervise from. 11. Have a picnic lunch/dinner of fish & chips by the water at the Mandurah Eastern Foreshore or at Dolphin Quay in the Mandurah Ocean Marina where there’s plenty of play equipment for the kids and paths for them to ride their bikes and scooters. 12. Learn how to crab on Mandurah Cruises 2 Hour Family Crabbing Tour where KIDS CRUISE FREE! Learn how to bait, catch, cook and eat Mandurah’s famous blue swimmer crabs with the expert crabbing team. 13. Mandurah’s has the best swimming spots for families! The Lido Beach at Keith homes reserve, Dolphin Quay is a calm, protected spot suitable for all ages and features great shaded areas, a pontoon, beach volleyball and an array of bars and cafes over looking it. Other protected beaches for families to enjoy a day at this summer include Henry Sutton Grove (Fairbridge bank), Town Beach (in front of Seashells Hotel), Doddies Beach (Halls Head) and Falcon Bay. 14. Check out the great program of FREE school holiday activities at the Mandurah, Falcon and Lakelands libraries. There’s something for all ages with knitting, tie-dye clothing making, dreamcatcher making, jewellery making, lego building and plenty of arts and crafts workshops. 15. There’s plenty happening at the Mandurah Aquatic & Recreation Centre – Take the kids to bounce and climb their way through the pool Inflatable course and to play in the heated kids water playground. Or get your skates on for the Roller Disco taking place on the 18th January. 16. The Billy Dower Youth Centre has some awesome FREE workshops targeted at teens including a gaming day, car maintenance workshops, resume writing and interview skills, youth yoga, street art, pop-up scooter/skate events and more. They are also hosting Beats Under the Bridge: Summer Youth Fest on the Western Foreshore on 30th January. 17. Visit King Carnival for a game off 18-hole mini golf, arcade games and rides galore. They are open from 10am to 10pm over the summer school holidays. 18. Have a go at fishing! There are so many great spots in Mandurah – jetties, rockwalls and beaches – to fish from or hire a boat and head out in the Peel-Harvey Estuary. Don’t forget you Recreational Fishing Guide and to take your fishing line and rubbish home with you so it doesn’t end up in our waterways. 19. All aboard “The Spirit of Mandurah” – Big Toot Tour with the Tourist Fun Train Company. It stops at 10 designated Stations around the City (from the Eastern Foreshore to the Mandurah Ocean Marina). You can hop on and off all day and kids are FREE! 20. Explore Mandurah’s waterways at your own leisure by hiring a kayak or stand up paddle board from Kayaks-4-U. They supply all the equipment including life jackets and their friendly team are happy to give you a quick lesson on how to paddle before you set off on your adventure. 21. Experience the region’s incredible aboriginal history and culture on a tour with George Walley from Mandurah Dreaming. Choose from the Walking Tour, Thrombolite Tour, River, Estuary & Ocean Tour or join us for our Dreamtime Cruise hosted by George on Sunday 6th, 20th or 3rd January. 22. Two playgrounds that are a must visit in Mandurah these holidays are Quarry Park in Meadow Springs and Harbour Playground in Secret Harbour. They are huge, modern playgrounds that will keep the kids busy for hours! Both parks also have BBQ facilities, picnic shelters and paths to ride bikes and scooters. 23. For just $50 a day per child, Dare Adventures in Dwellingup, will take the kids on a whole day (7:30am to 5pm) of fun and educational activities. Bus pick up and return from the Mandurah Train Station. 24. Get lost at Mandurah Amaze Miniature Park! It features an extensive display of scale model miniature buildings and railways, a huge hedge maze, 12-hole mini golf course, playground and picnic area and incredible landscaped gardens. 25. Enjoy a unique, hands on experience at Peel Zoo where you can feed the animals, hold a snake, pat a kangaroo, tickle a ferret and more. There are over 100 species of birds and animals to encounter, including koalas, wombats, dingoes, exotic birds, reptiles and Tasmanian devils. 26. 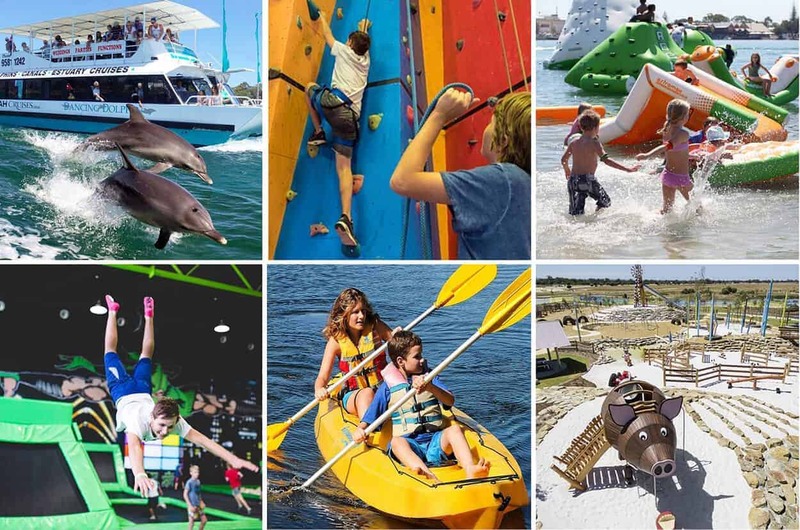 Visit WA’s best playground – Adventurescape South Yunderup! This farm themed playground will keep the kids occupied for hours with a 35m flying fox, giant pig cubby house, 9m tall climing windmill tower and slide, fence maze, swings, fibreglass animal sculptures and more. There are also BBQ facilities, picnic shelters and paths to ride bikes and scooters. 27. Sunset Horse Tours offer family friendly horse-riding experiences. Their 30-minute ride is designed for children aged between 3 -12 years old (or nervous / first time adult riders). They also offer own a horse for a day courses, 2 hour and 4 hour horse riding experiences and more. 28. Serpentine Falls in Serpentine National Park offers a great day out for the family. Take a picnic lunch and enjoy a hike, swim and family time on the huge grassy picnic and play area. There have shaded picnic tables, gas barbeques and toilets onsite. 29. Get climbing at Trees Adventure in Dwellingup. It will have all the family swinging, leaping, climbing and flying through the forest with exciting and challenging obstacle courses, suitable for all ages. While in Dwellingup jump on board Hotham Valley’s historic Forest Train for a tour through the beautiful Jarrah Forest from Dwellingup to Etmilyn. 30. Visit Caraholly Orchard in Dwellingup. During the school holidays they are having some great family events on the farm featuring their amazing range of fresh fruit and vegetables, food trucks, animal feeding and more. For more great school holiday adventures in Mandurah and the Peel region go to Visit Peel.